The standalone Vodafone is starting to look healthier. The mobile telecom operator will become dramatically smaller after it quits the United States and returns $84 billion to its shareholders. Elsewhere, its sales have been falling faster and faster. Now it looks like the worst is past and Vodafone hopes to ride a boom in mobile data. Yet for investors, the top question is what part the group will play in future M&A. Vodafone has suffered from fierce competition and regulation, technological change that handed the advantage back to groups combining fixed and mobile services, and Europe’s economic slump. The latest quarterly results showed the group’s preferred sales measure, “organic service revenue,” falling again, by 4.8 percent. This represents a scant 0.1 percentage-point improvement on the previous quarter, which was the worst since sales started declining in mid-2012. But this looks like an inflection point. Boss Vittorio Colao is confident that sales will pick up as smartphone-wielding, YouTube-watching customers power a surge in data usage. That is welcome news for shareholders. And Vodafone’s “Project Spring” strategy – to plough billions of pounds into upgrading networks – makes sense. Yet self-help remains less central to the Vodafone investment case than deal-making. AT&T recently ruled itself out of bidding for Vodafone for six months, but the U.S. giant could return. And the British company must have more deals of its own up the sleeve. The most likely are those that will give it fixed-line networks where it cannot build or rent others on favourable terms. Vodafone is already swallowing Germany’s Kabel Deutschland. It could follow that with Ono, the Spanish cable operator, and then perhaps Fastweb, the Italian broadband outfit owned by Swisscom. In both countries, the status quo is dismal: the UK operator’s sales fell 14.1 percent in Spain and 16.6 percent in Italy this quarter. There could also be much bigger deals – acquiring Liberty Global, perhaps – or radical corporate surgery. If AT&T’s interest has indeed flagged, Vodafone could look more enticing by spinning off its emerging markets businesses. Fixing the core business makes the pressure for radical change slightly less pressing. But Vodafone could still look very different in a few years’ time. 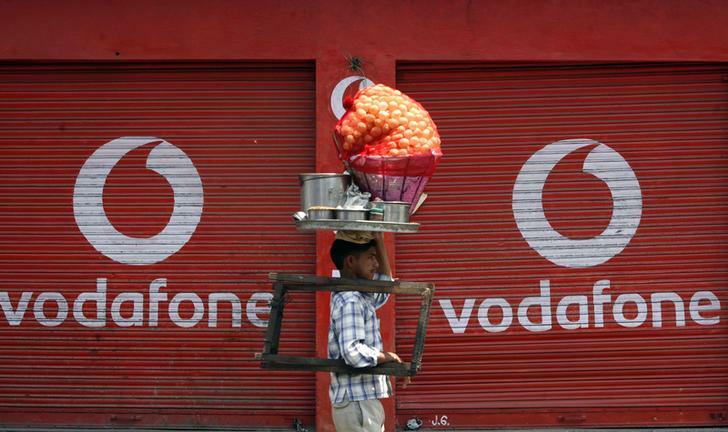 A vendor selling "paani puri", a traditional Indian snack, walks past closed shops displaying an advertisement for Vodafone in Jammu. Vodafone, the world’s second-biggest mobile phone operator, said its preferred measure of sales fell by 4.8 percent, on an organic basis, in the three months ended Dec. 31. This “group service revenue,” which excludes handset sales, stood at 9.856 billion pounds in the quarter. Vodafone also re-affirmed its target of 5 billion pounds in adjusted operating profit for the year ending March 31. Organic service revenue has been shrinking increasingly rapidly since mid-2012. The previous quarter saw the contraction steepen to 4.9 percent. By late morning on Feb. 6, Vodafone stock stood 2.7 percent higher at 221.8 pence a share.